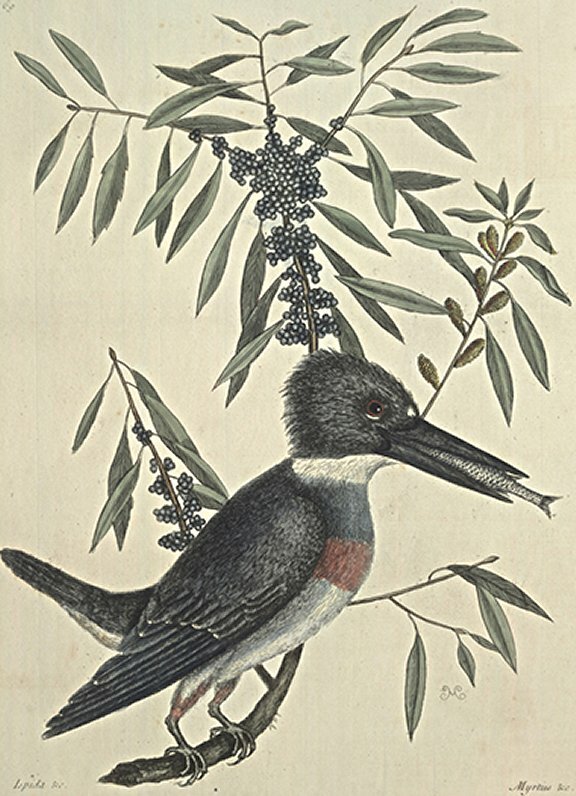 This Kind of King's-fisher is somewhat larger than a Blackbird. The Bill is two Inches and an half long, and black. The Eyes are large. His Head is cover'd with long blewish Feathers. Under the Eye there is a white Spit, and another at the Basis of the upper Mandible of the Bill. All the Upper-part of the Body is of a dusky blue. The Neck is white, with a broad Lift of dusky blue cross it; under which the Breast is muddy red. The Belly is white. The Quill-Feathers of the Wing are black, having some white on their interior Vanes, edged with blue and black, with transverse white Spots, not appearing but when the Wing is spread often. The Tail is dusky blue, with the End white, as are most of the Qui11 Feathers. It has four Toes, one only being behind. Its Cry, its solitary Abode about Rivers, and its Manner of Feeding, are much the same as of those in England. It preys not only on Fish but likewise on Lizards. These are usually but small Trees or Shrubs, aboat Twelve Foot high, with crooked Stems, branching forth near the Ground irregularly. The Leaves are long, narrow, and sharp-pointed. Some Trees have most of their Leaves serrated; others not. In May, the small Branches are alternately and thick set with oblong Tufts of very small Flowers resembling, in Form and Size, the Catkins of the Hazel-Tree, coloured with Red and Green. These are succeeded by small Clusters of blue Berries, close connected, like Bunches of Grapes. The Kernel is inclosed in an oblong hard Stone, incrustated over with an unctuous mealy Consistence; which is what yields the Wax; of which Candles are made in the following Manner. In November and December, at which time the Berries are mature, a Man with his Family will remove from his Home to some Island or Sandbanks near the Sea, where these Trees most abound, taking with him Kettles to boil the Berries in. He builds a Hut with Palmeto-Leaves, for the Shelter of Himself and Family while they stay, which is commonly Three or Four Weeks. The Man cuts down the Trees, while the Children strip off the Berries into a Porrige-Pot; and having put Water to 'em, they boil them 'till the Oil floats, which is skim'd off into another Vessel. This is repeated till there remains no more Oil. This, when cold, hardens to the Consistence of Wax, and is of a dirty green Colour. Then they boil it Again, and clarify it in brass Kettles; which gives it a transparent Greenness. These Candles burn a long Time, and yield a grateful Smell. They usually add a fourth Part of Tallow; which makes them burn clearer.